"Doesn't look anything like the films I saw when I was a kid, I mean, remember Jabba the Hutt? It was all like gross and grimy and dripping? This is nothing like that, it's too clean, everything looks too pretty." — Nadine, Mr. Plinkett's Attack of the Clones review. A game, movie or TV show will come out, and run its course. Sometime later, the same developers, or a new team will decide to create a prequel to the original. Compared to when the original came out, technology has advanced, allowing better graphics, better features, better special effects, etc. However, even though the setting of the prequel is stated to be less "advanced" than the setting of the original, you wouldn't know that from just observing it. See, this can be a bit of a dilemma when it comes to visual and interactive media, concerning not only prequels, but spinoffs as well. Designers often try to evolve and make their works look better than their previous ones, even when the story they're working on occurs way before their earlier designs. The end result is that their designs for the prequel/spinoff looks or feels better than what they had in the current storyline. That's what this trope is all about. This is common in prequels to sci-fi works created in the mid 20th century, but whose prequels were done in the late 20th and this century. While the original is rife with outdated technology, the more "primitive" prequel will have tech that looks like it came straight out of an Apple Store (iPod look optional). The Literary Agent Hypothesis helps suspend one's disbelief when this trope comes into play; that is, the progression of technological sophistication is not arbitrary or backwards, but merely subject to the special effects and budgetary constraints of the modern-day reproduction. If technology had regressed in-universe in the time between the prequel and the original (for instance, if the original is set After the End and the prequel is set Just Before the End), this trope does not apply. Compare and contrast with The Aesthetics of Technology, Evolutionary Retcon, and Zeerust. May be a specific instance of Older Is Better. See also Zeerust Canon. For example, take the reputed F91 Gundam in comparison to the Unicorn. The Mobile Suit Gundam F91 takes place decades in the future whereas the Unicorn is only a few years after Char's Counterattack. Guess which one looks more advanced? The cake may go to the anime of Mobile Suit Gundam: The Origin. Despite being set before the One Year War, these first generation Zakus are zipping around and pulling maneuvers that put much more advanced mecha from older series to shame. Granted, the ones pulling off said maneuvers are well-established in the original series as Zeon's Ace Pilots by the time Amuro climbs into the Gundam's cockpit for the first time. Another contender for most egregious example is Mobile Suit Gundam Thunderbolt. This is again set during the One Year War, the first war using mobile suits. The Full-Armor Gundam in Thunderbolt makes the F91 (a bleeding-edge high-mobility suit from 44 years in the future) look like a tortoise in molasses. Played with regarding the VF-0 in Macross Zero, which does have some sleeker-looking bits and various features not found on the Variable Fighters in the original Super Dimension Fortress Macross; however, its overall design is bulkier and less refined than the VF-1, with very spindly, unfinished-looking arms, all of which makes sense for a prototype. Played straighter with the Rebel VFs, however, who look more like the mechs from post-SDF sequel Macross Plus, with just a few spindly, unfinished mechanical touches of their own to remind us that they're early prototypes. Word of God is that FLCL Alternative is actually a Stealth Prequel to the original and Progressive—yet it features smartphones, flatscreen screens, and more modern concepts for 2018 than the 2000-2001 original series. The technology in the Star Wars prequels looks much shinier than it will two or three decades later. In-universe, this is because ships and architecture of the Old Republic were designed for comfort and luxury, while Imperial vessels are mass-produced warships that prioritize function over aesthetics. And the Rebels pretty much grabbed whatever they could. Although it must be said that the prequel technology is not significantly more primitive than the original trilogy technology (except for a few superweapons like the Death Star), but is mostly the same, only with more styling. The effect is actually pretty obvious over the course of the prequel trilogy, with things well on their way to how they will look in A New Hope by the end of it. Rogue One closes the circle by showing the final stage of this degrading, with several prequel vehicles and devices that have been given the aesthetic of the original trilogy. Star Trek (2009): It's in the strange position of being part Continuity Reboot and part prequel. Unlike the Enterprise example there was almost no attempt at a "retro-future" look and the technology looks like it would rival anything from The Next Generation shows (24th Century). The bridge looking like an Apple Store was stated by the production team itself. The engine room, on the other hand, looks like it would pass muster on a modern-day military warship (assuming said warship contained a brewery). In-universe this is justified with the Enterprise using technology reverse engineered from the Narada (a ship that traveled in time from a post-TNG period). The titular ship of Prometheus certainly looks more advanced than the Nostromo from Alien. It could be justified, however, by the fact that the Prometheus is a brand new expedition ship while the Nostromo is the equivalent of an old space truck. There are also many similarities in design for those who can search them out. Alien: Covenant, which is supposedly set only 18 years before the original, makes this trope even more apparent. A variation appears in Final Destination 5, the twist being that the 2011 sequel is actually a Stealth Prequel to the original film. Computer screens and cell phones used in the movie are noticeably sleeker-looking than those used in the original- while these would have technically been available in 2000, they would have been expensive and barely on the market. Clothing is also more fitted and tailored than the baggy ensembles of Final Destination. However, this trope was likely intentionally invoked by the filmmakers as a means of misleading audiences about the time period, which is only revealed in the film's final moments. Star Trek: The Original Series compared to Star Trek: Enterprise. Where the TOS NCC-1701 Enterprise computers just look like shinier 1960s computers, NX-01 Enterprise computers would look cutting edge to 2000s computers. 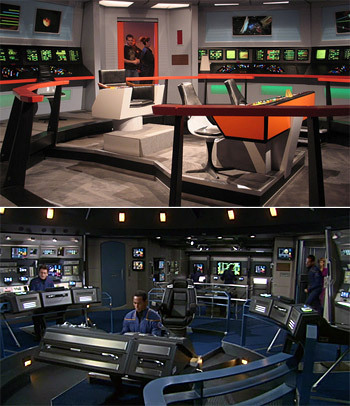 Though if you compare the TOS movies (with their higher budget and better designed sets) then it actually does look somewhere between Star Trek: Enterprise and the 24th century shows. If Star Trek: Enterprise looks advanced compared to The Original Series, 2017's Star Trek: Discovery looks advanced compared even to the later Next Generation theatrical films. Some fans have gone as far as to declare it an obvious reboot based solely on the updated visuals. This also applies to technology levels, such as site-to-site transport. In DIS, characters can have the computer beam them to any location on the ship with a simple voice command. In TOS, all transports required a manual operator and a site-to-site transport within the ship was considered dangerous and was a more involved process, requiring the traveller to be beamed to the pad then to the destination. It's really hard to believe that Starfleet went from the technological marvel that is Discovery to something less advanced like the original post-NX USS Enterprise in a mere decade. Many argue the retcon is necessary given the contemporary ideals of the future are vastly different to those in the 1960s. However, every Star Trek show up until Discovery maintained the look of the original series whenever characters happened to be in that era of the Trek Verse (most notably a couple of episodes in DS9 and Enterprise). This gave some the impression that the classic look of the 23rd century, though somewhat antiquated, should've been maintained canonically. Season 2 establishes that the Enterprise-1701 and the Discovery are contemporary, and implies that Discovery's status as a testbed of not-ready-for-prime-time technology extends beyond the spore drive. It also says that using viewscreens instead of holograms is Captain Pike's personal preference, which doesn't entirely explain why holocoms are never seen again until DS9, but at least acknowledges the question. In case of the Original Series aesthetics, it's established during Star Trek: Deep Space Nine that it's not a difference in production, but the appearance of the sets and props looked like that In-Universe. Dax even gets a bit nostalgic. The visual effects, most notably the hyperspace jump points, are more advanced-looking in Babylon 5's aborted spin-off The Legend of the Rangers than they are in its earlier short-lived spin-off Crusade, but The Legend of the Rangers is actually set a year and a half before Crusade. An example that only briefly appears: Battlestar Galactica: Blood & Chrome takes place some time before Battlestar Galactica (2003) — something like 30-40 years prior, considering the main character's age. In Blood and Chrome, a pre-mission briefing is conducted using something like virtual reality goggles. By the time the main series rolls around, plastic figurines on a two-dimensional map are used instead. Justified in that the Galactica is so old as to be considered a museum piece by the time of the reimagined series, and furthermore, the ship eschews many forms of high technology (the computers aren't even networked) to protect against Cylon viruses. The Batman prequel series Gotham is an interesting case. Though it is set a good 10-15 years before Bruce Wayne will become Batman, Batman stories (and by extension, backstories) typically exist on a sliding timescale rather than being tied to a specific era. Nonetheless, the makers have taken efforts to avoid this trope by giving Gotham a 'timeless, anachronistic' feel, with a mix of 70's taxi cabs, flip-phones, typewriters, 40's clothing, and modern-day demographics. Dragon Quest III takes place before Dragon Quest I, and shows monsters, items, spells, and ship travel that would not be known to the player until Dragon Quest II, taking place a generation after the first game. Erdrick/Loto's sword is more powerful than in the first game, and has the ability to cast spells. The Sims 3 is set 25 years before the original, when many of the iconic characters such as Mortimer, Bella and Bob Newbie were much younger, yet the game is packaged with 2009 fashion, 2009 furniture, 2009 tech, and 2009 houses, compared to the early 2000s feel of the original game. Deus Ex, compared to its prequels, Human Revolution, Deus Ex: The Fall and Mankind Divided. The original is set in 2052, where nano augmentation is replacing mechanical augmentation, but Human Revolution, set in 2027, make Deus Ex look far more primitive. Word of God for Human Revolution has handwaved this by saying that the game is set during a "golden age" of technology which was immediately followed by the economic and socio-political collapse that created the Crapsack World of the original and caused technology to become more cost effective. Interestingly, Word of God for the original noted the preponderance of slum levels, suggesting the more advanced tech was "off screen", so to speak. Also one thing to note is that while the mechanical augmentations in the original game look clunky compared to the ones in the prequels, it should be noted that the only heavy augmentations ever really seen are usually on military or security types, which would prioritize function over form. The majority of augmentations seen in the prequels are civilian-grade, which would be more aesthetically pleasing. On the other hand, the first game only had a handful of augmented NPCs, all of whom were military, security or criminal types. Unlike Human Revolution and Mankind Divided, normal civilians weren't ever shown or implied to use augmentations, suggesting that at least augmentation technology was less advanced than it was in the prequels, where augmentations were much more integrated in everyday life. On the other hand, given the enormous backlash against augmentation and discrimination against augs seen in Mankind Divided, it makes sense that the number of civilian users would drop drastically. The Nitrome Flash game Final Ninja and its prequel, Final Ninja Zero. The latter is set decades before the original, yet the enemies and traps are tougher and deadlier than those in the original, and many mooks in the game have no equivalents in the original at all. Devil May Cry 3: Dante's Awakening is set before Devil May Cry, yet the controls are significantly more elaborate in DMC 3, leaving Dante  by comparison  positively arthritic in the original. With the introduction of the Big Boss-oriented prequel games in the Metal Gear series, this trope has firmly sunk its claws into the franchise. With the Big Boss games taking place during a timespan from 1964 through 1984 (as opposed to the games starring Solid Snake, which all occur during a timeframe of 1995 to 2014), specifically with Metal Gear Solid: Peace Walker and Metal Gear Solid V: The Phantom Pain (the two mainline games directed by Hideo Kojima following the release of Metal Gear Solid 4: Guns of the Patriots, which was written to conclude the series). It's shocking to see Big Boss confront amazingly high-tech machines that look as if they would be more at home in the 21st century than the 20th century, such as the A.I. Weapons and Zeke in PW (set in 1974), and Sahelanthropus in TPP (set in 1984). Aside from looking infinitely more advanced, they're shown in combat to be much more agile and powerful than everything found in the original MSX games, which take place a decade after TPP. Even the REX from the first MGS looks sluggish in comparison, with its nuclear-capable railgun having already been used by the Chrysalis and Zeke in PW. This is particularly egregious with Sahelanthropus, a humanoid-looking Metal Gear with functional arms capable of standing upright, which looks more like a predecessor to the Orbital Frames from the Zone of the Enders series than the direct precursor to the TX-55 that it's supposed to be. Awkward Zombie illustrates . In the Ace Attorney franchise, Investigations has a camera phone (that may be a "smart" phone with its design and the fact that its owner was obsessively playing with it), while the chronologically years afterwards Apollo Justice uses (already slightly dated at the time of release) flip phones. It also features a color video with sound in case 4, which is set before anything else in the series (which uses black and white during the original trilogy). The bizarre part is that it is on a tape while the same case features a wide screen flat panel TV. Though this makes some sense considering it was meant to analyze security camera footage, which is often recorded on tape to reduce costs. It's also possible the phone design is more primitive, and camera phones are very expensive, the characters with ones are an Interpol agent and an international prosecutor. Other characters are probably just using more affordable versions. It seems that living in such a murder-filled universe has its advantages though, as a fingerprint set that includes a machine that can analyze prints in under a minute is PORTABLE. Japanese flip phones are insanely advanced and extremely common in Japan compared to smartphones, anyways. In Japan, flip phones are much preferred to modern smart phones, and are even 'Galapagos phones', due to the unique isolation of an ostensibly obsolete technology. The localized US versions of the games are supposedly set in America, though only infrequent mentions in dialogue make that apparent. The actual look of the game is very obviously Japanese. Hard Corps: Uprising (released in 2011, set in 2613) is set two decades before the original Contra (released in 1987, set in 2636), but the weapons and technology shown in the game are way more advanced than anything featured in the original arcade and NES games, or even the 16-bit installments Contra III and Contra: Hard Corps. Wipeout avoids this by setting each new installment of the anti-gravity racing franchise a few decennia farther in the future and sticking to a stylised clean and immaculate future (with the exception of two highly dystopic editions). However the scope of the racing league seems to follow a backwards trend: the first game features a track on Mars and a polar track made out of 'artificial crystal'. Recent games are set in a generic future city. Even the track design itself grows more realistic, going from vertical drops and multiple track splits to mostly flat undulating tracks with few jumps and magnetic strips liberally applied to any place where the ship could leave the ground. This is because technology marches on, in particular game physics engines. According to Hyrule Historia, the events of The Legend of Zelda: Ocarina of Time diverge into three timelines. One of these leads into the first four games of the franchise (as well as the The Legend of Zelda: Oracle Games, released three years after). The book calls this the "era of decline". The Legend of Zelda: Skyward Sword is perhaps the most egregious example. Word of God says that it's the first in the timeline, but it has an entire dungeon based on electricity and Schizo Tech. There are also robots. Even stranger, the robots and electricity are from even further in the past and are only restored to working order through time-reversal stones. Prequel Halo: Reach has a certain degree of justification for why you have certain weapons and abilities that weren't available in the original Halo: Combat Evolved, largely that CE was about the crew of a single ship being trapped with limited supplies. In contrast, Reach takes place on the largest human colony and the headquarters of military research and development, with several of your toys being prototypes that didn't get a chance to be produced elsewhere (hence why you don't see them in the original trilogy). That said, the Spartan Laser is still a bit anachronistic to its first appearance in Halo 3. The Covenant itself has weapons that were never seen in any previous game; in particular, the needle rifle is far superior to the Needler and Carbine (although the focus rifle is inferior to the beam rifle). It's handwaved as a mix of the battle of Reach hurting the Covenant enough to momentarily deplete some of their stockpiles, and the Covenant genuinely not giving a crap about standardizing their equipment across their fleets, though none of this completely explains why the Covenant in the first game, who were part of the same fleet as in Reach, don't have those weapons (especially considering that the Anniversary remake did retcon them into wearing Reach-style armor). The Cole Protocol tends to be a double edged sword when it comes to preventing human technology from falling into Covenant hands. It says that any human ships "jumping" from an encounter with the Covenant have to make the jump at random. If they're in danger of capture, they have to scrub their astral navigation databases and computers, and self-destruct if they are at risk of capture. Considering that the entire planet Reach was an encounter, it makes sense that there would be no time for the more advanced human tech to be mass-produced and distributed in the less-than-four months between the start of Reach and the end of Halo 3, especially since they were still in testing. Oddly, one aspect where Reach averts this is in the design of the non-Spartan soldiers' armour: individual plates are blockier, more poorly-fitted to the body and generally less comprehensive when compared with the Marines in the first game (though CE Anniversary retcons them into wearing Reach-style armor) or on Earth in the second and third; most personnel don't have any protection for their lower arms and legs. Additionally, the Orbital Drop Shock Troopers seem to wear much the same armour (but with the addition of their distinctive plastron, pauldrons and vambraces from Halo 3: ODST) and the same two-piece twill battle-dress as the Army and Marine troops, where by contrast the previous two games had ODSTs sporting full-body plating over armoured vacuum-enabled bodysuits. This is made doubly strange by the idea, as mentioned above, that Reach was the point-of-origin for the UNSC's more advanced kit. Halo Wars also shows this trope, where the UNSC has a ton of better vehicles and technology, including aircraft like Vultures, Humongous Mecha like the Cyclops, advanced bases, tanks with reverse-engineered plasma cannons, and even more protective armor for the infantry! The original trilogy has none of this, even though Halo Wars takes place two decades before the first game. Some canon has handwaved this by saying the advanced tech became too expensive later in the timeline, especially as the war began to take a toll on humanity. Games taking place after the Human-Covenant War mitigate this somewhat. Halo 4 starts off with only Halo 3-era weaponry, and once reunited with UNSC forces you can find armor mods and use weapons only previously shown in Reach, supporting the theory of weapon/tech adoption being slow because of the war. Additionally, the Infinity is the newest UNSC flagship outfitted with reverse-engineered Covenant and Forerunner tech, and has the largest single contingent of Spartan-IVs in the entire galaxy. It makes sense that it would have all the toys. The Metroid Prime Trilogy falls into this, taking place in between the first two games. Ridley goes from a massive winged cyborg, to a somewhat large purple dragon with tiny wings. Samus goes from utilizing complex combos to more standard beams. This may be justified, however. In most of the games, the Chozo left the planet long ago; however, in Metroid Prime, they recently ascended, only to be pulled back to the mortal plane by Phazon pollution (it's implied that Tallon IV was the last mortal Chozo outpost), after which they had a vision of Samus fighting off the entity in the impact crater. It can therefore be inferred that the tech on Tallon IV actually is more advanced than the technology from their older outposts, and that they made it specifically to help Samus on her quest. In addition, some of the technology later in the series actually shows signs of being more advanced, as well; the Zebesian Super Missiles are a separate weapon system, while the Tallon IV (and Aether) Super Missiles are basically formed by jury-rigging the Power Beam & Missile Launcher to fire a combined projectile. So, basically, the series plays with this: the Prime trilogy's technology actually is more advanced, due to being made chronologically later than the technology seen in later installments; however, there are cases where the older technology works better than the more advanced models. The Batsuit in Batman: Arkham Origins appears to be much more protective and overall more advanced looking than the Batsuits in the other Arkham games. This was intentional, to suggest he was basing it off rejected R&D prototypes rather than building them from scratch for himself. The suit looks tough but is also raw and strapped together. Some fans have surmised that he got better at evasion and stealth, and so increased his flexibility. Batman: Arkham Knight shows Batman with a new suit that combines the armored look of Origins with a flexible fabric undersuit similar to what is used in the other games, presumably due to the higher threat level without Joker to keep playing the bad guys against each other. Mass Effect's weapons could fire indefinitely (barring cooldown requirements) with no need for reloading or maintenance, but each subsequent game required the use of "heat sinks" that were functionally identical to expendable magazines or clips. It's explained a little better In-Universe, but the functional impression is that firearm design is getting less efficient over time. Bioware said they tried a hybrid system, but it wasn't fun for playtesters. This is actually lampshaded by Conrad Verner in Mass Effect 3, who was apparently unaware of the invention of thermal clips and when the concept is explained to him, he feels like it's a step backward. Pokémon Omega Ruby and Alpha Sapphire takes place at the same time as FireRed and LeafGreen, which means it takes place before almost every other game. The technology is noticeably more advanced in Hoenn compared to, say, Sinnoh despite the latter being at minimum four years later. There's even a reference to the Nintendo DS being older than the twelve year old protagonist (though it could have been a Game & Watch as well), when it and the Wii were apparently new during DPPT and HGSS. The protagonist in ORAS also has a Wii U, much like the XY protagonist, despite the fact the latter takes place over ten years later. There is some implications that there is an Alternate Timeline in place so it's possible that the DS games take place in a different universe from the 3DS ones, explaining the technological difference. Additionally, in Real Life not all first-world nations use the same levels of technology; for instance, Japan still widely uses fax machines and lacks outdoor ATMs, believing that if it isn't broke, don't fix it, compared to America's philosophy of replacing it regardless just because it's old. Since Hoenn and Sinnoh are two separate regions (which are treated In-Universe as separate nations), the use of this trope wouldn't be too out of place with or without the alternate timelines. Five Nights at Freddy's 2 is only revealed to be a prequel at the end of the game (set in 1987), but until then, with its cleaner and more modern aestheics, coupled with its high-tech robots beyond anything even at the year of the game's release, you'd be forgiven for thinking it took place much later. A partial justification (or Hand Wave, depending on your opinion) is that Freddy Fazbear's Pizzeria was at it's prime in 1987 and fabulously wealthy, but by the time of the first game the restaurant has been in financial ruin for years and is months away from bankruptcy, hence why the sleek high-tech androids were scrapped in favor of the more primitive and cheaper-to-maintain animatronics and the building isn't as well-kept. The Voice with an Internet Connection also handwaves it further by stating that the primitive robots from the first game were much older than the prequel robots, but were retrofitted with some of the same advanced computing and sensor technology, hence why they were being used instead of the androids from the prequel. Awkward Zombie skewers how the Metal Gear series (see above) has fallen into this here . "The hard part about releasing a game in 2015 set in 1984 that's a prequel to a game released in 1987 and set in 1995 while yet itself a sequel to several games set further in the past is that you've bracketed yourself into a narrow band of available technology." Since it shows the first meeting of Donald and José, Legend of the Three Caballeros is presumably a prequel to the original The Three Caballeros film. Nonetheless, modern technology like the Internet and camera phones are all over the place. The answer, if there is one to be had, probably lies somewhere between Comic-Book Time and Soft Reboot. Scooby-Doo, Where Are You! is firmly within The '60s as far as fashion, hairstyles, culture, and slang go. A Pup Named Scooby-Doo, however, is supposed to be set when the characters were children, and yet it is clearly in the late 80's or the early 90's. This is most noticeable with Velma, who in A Pup Named Scooby-Doo rides a rocket-powered skateboard and carries a box-shaped desktop computer with her.